Corian® Quartz (formerly Zodiaq® Quartz) was one of the first quartz surfaces on the market, in 2000. Engineered with pure quartz crystals, quartz countertops from Corian® Design let you bring the best of both worlds - nature and science — to your kitchen, bath and throughout your home. 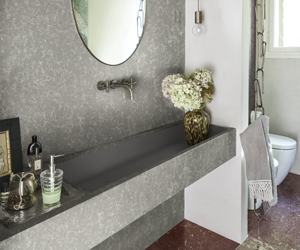 Made with extremely hard quartz crystals, Corian® Quartz keeps its good looks and survives the impact of nicks and cuts that can occur with daily wear and tear, minimizing short and long-term maintenance. Quartz is found in great abundance in the earth - it is naturally hard and scratch-resistant. Quartz even ranks a 7.0 on Moh's Hardness Scale, which is used to measure the scratch-resistance of a material. Only diamonds, ranking 10, topaz, and sapphire are harder than quartz. Unlike other materials, you never have to seal, polish or recondition the surface to maintain its luster. It can be easily cleaned with soap and water and doesn't require sealants or waxes. In addition, Corian® Quartz contributes to sustainable design. Corian® Quartz and its adhesives and sealants meet or exceed emissions guidelines for volatile organic compounds, are low-emitting and are nontoxic and nonallergenic for humans. So you can feel more comfortable knowing that your family and friends are in good hands! Corian® Quartz slabs are manufactured using Breton vibrocompaction casting process. The quality of the final product highly depends on the quality of the raw stone being used in the process. Corian® Quartz only uses the purest grades of material to ensure highest quality standard.